Looking for a good reason to spend the night in Madison? There’s a great event planned in town that will knock your designer socks off. For just $120 you’ll get a comfy room including a gourmet breakfast at the Scranton Seahorse Inn AND two tickets to the Fashion Affair. We’re are also one of many terrific restaurants providing food for the event which is a short two minute walk from our front door. Book soon because this event sold out last year! 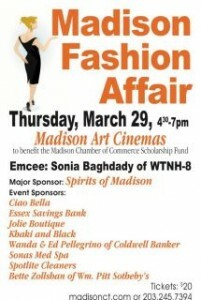 Step into Style at the Madison Chamber’s Fashion Affair! The Madison Chamber of Commerce is teaming up with its fashion members to present the second annual Madison Fashion Affair on Thursday, March 29 from 4:30-7pm at the Madison Art Cinemas. Last year’s event was a resounding, sold-out success, raising $5,000 for the Chamber’s scholarship fund. 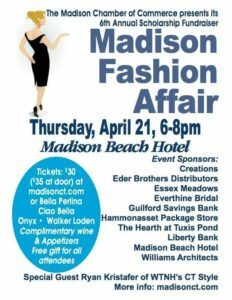 Emceed by WTNH-8′s Sonia Baghdady, this high style event will benefit the Chamber’s Scholarship program. We’ll kick off the evening at 4:30pm with a wine and hors d’oeuvres as guests peruse the silent auction. 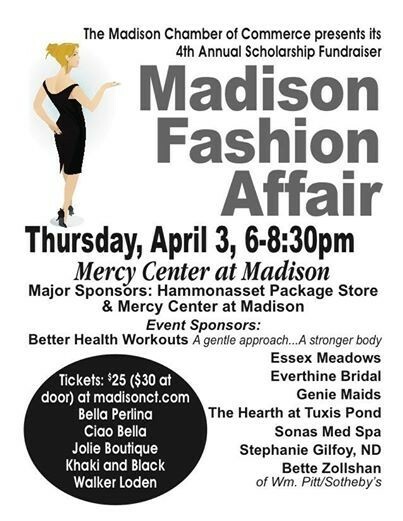 Attendees will then be guided into the theater to catch a glimpse of Spring fashions as models display clothes and accessories available at local Madison retailers and Chamber members. After mingling with models and friends, guests will then leave with a goodie bag containing a spring-colored pashmina wrap as well as exclusive coupons and and certificates for use at select merchants around town.